Hell yes–wheels down on Mars again! 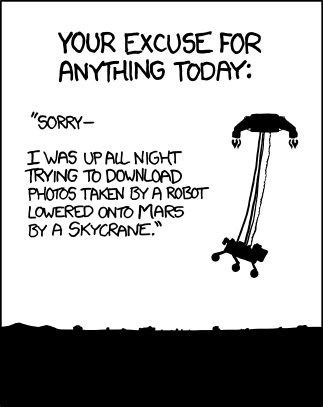 We all stayed up last night to watch Curiosity land on Mars. 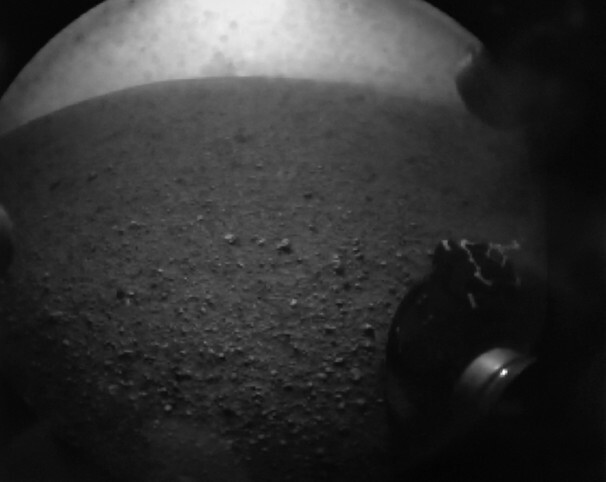 It was amazing, to be watching the live feed from Mission Control at JPL, hearing the live telemetry being relayed, and then just moments after touchdown get to see the first photo sent back by the rover (it’s grainy and blurry because the transparent lens cap is still on the camera to protect it from the dust kicked up by the landing). I was particularly engaged because I had gotten to see parts of the actual spacecraft, including the aeroshell and rocket skycrane, during a tour of JPL two and a half years ago. Strange and amazing to know that the same machinery I saw in the big white room at JPL is now on Mars. During the landing, data were relayed back by the Mars Odyssey spacecraft, which has been in orbit around Mars for 10 years, 9 months, and 13 days. This decade-old craft was never designed to function as a data relay, but, you know, engineers are smart. Curiosity joins the rover Opportunity, which is still going strong 3116 days into its 92.5-day mission. Turns out, we weren’t the only ones watching the landing. The Mars Reconnaissance Orbiter got a photo of Curiosity on the way down, using its HiRISE camera. 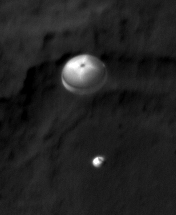 This is the second time MRO has caught a Mars lander on the way down; it got a photo of Phoenix descending under its parachute back in 2008.